Moderating the conversation regarding your social marketing campaign is a delicate balance. Unfortunately, you may have to delete comments by users. On the one hand, you want people to speak freely, but on the other, you don’t want any abusive language or behavior, and you definitely don’t want spam. For the most part, the people who occupy Google+ are respectful and drama-free. From time to time, you’ll encounter a few people who like stirring the pot a little by name calling, swearing, or being mean. Some of the things that might fly on a personal page (such as swearing) would be considered offensive on a brand page. Make sure all comments are appropriate for your entire community. Click the X located to the right of each comment. In the box that appears, click the Delete button or the Delete and Block This User button. 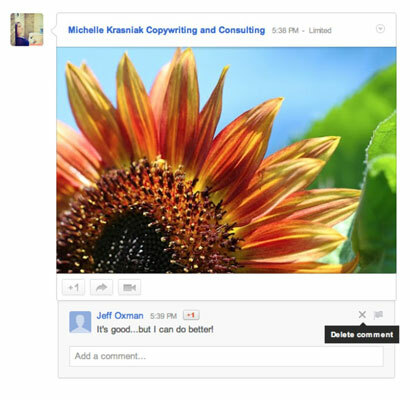 Just selecting the Delete option will still allow the user to comment on your items; however, clicking the Delete and Block This User button kicks the commenter out of your Circle. Next to the X is a flag you can use to report abuse to Google or block the user from commenting on your posts again.